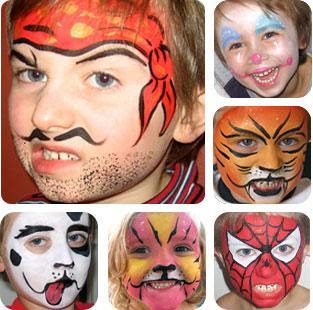 Face Painting is a great skill to have, as a parent and a party planner. It is a great entertainment for kids parties, but adults often enjoy it too! It can be hard to find a good face painter, as they are always in demand! If you are just getting started, it might cost a bit to get your kit going, but you will find it will last for quite a while - but why not split the cost with someone else. It is also great to share your skills with another parent in your kids friends' group so that you can share the job, and if you are any good, you will no doubt get asked to do it at everyone's party, and it's good to be able to call on someone else to do it or share the job! Combine that with hours of watching youtube videos, I feel pretty confident that I could adapt my knowledge to create just about any theme face a child could throw at me! The best thing - is just practice!!! Play with your own kids- the neighbour's kids- or you can purchase an old hairdressing mannequin. Try out new designs, and simply wash it off and start again! Are YOU a Shady Party Host? Firstly I want to let you know that I haven't been ignoring the blog, but been working very hard on our new website, with hundreds of products, it's been hard work getting it all together. So for this installment, let explore some options for protection from the sun. 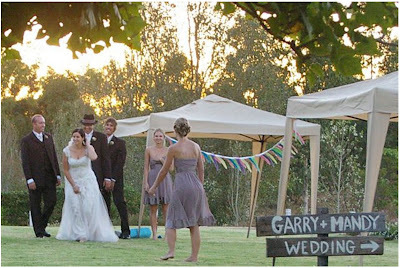 With such warm weather here is Oz - we have to think about shelter from the sun for all of our wonderful, outdoor parties and weddings. 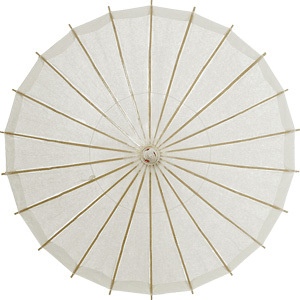 Parasols are becoming extremely popular for the bridal party, but what about your guests? They can be expensive to buy, and what do you do with them afterwards - so why not consider hiring them? Provide parasols for use during the ceremony, they give your guests instant shade and add a splash of color to your photos. My sister's wedding was about 500m from where the guests arrived to the ceremony site, so we offered guests to use them for the stroll down to the ceremony, and not only were guests greatful and surprised, it was a beautiful sight and added interest to photos. Fans are coming very popular too. 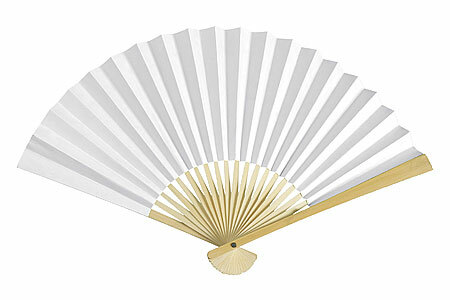 Hand held fans give an instant breeze when they're isn't a natural one to be found. We set them on each ceremony chair and had them displayed in a basket for guests to take as they wanted. There are tons of options in all kinds of colours and in all budget levels. And if you want a super cool idea for fans - you can even have your Order of Service printed on them. And last but not least - what about Portable Shade Shelters (we call them Cabanas). These are a great investment if you entertain a lot, especially great if you have a Garden that you can't get a marquee in. you can pick up a 3x3m shelter for under $50, and can give you peace of mind in all kinds of weather conditions. They provide shelter from the bright, hot sunshine, or shelter your buffet from a possible light rain shower. I have had a larger one of these for years and has been used for market stalls, picnics, days at the beach, and it's seen more than it's fair share of parties. We also used these to provide shelter for the Garden games at my sisters' wedding and they looked great with the bunting hung between them. Would love to hear feedback about the blog & anything you'd like to see in it. Fairy Bread - the stuff Dreams are made of! Fairy Bread is the ultimate "gotta smile" food. The taste is really nothing spectacular, but the memories and joy it brings back, is something not found in many foods. 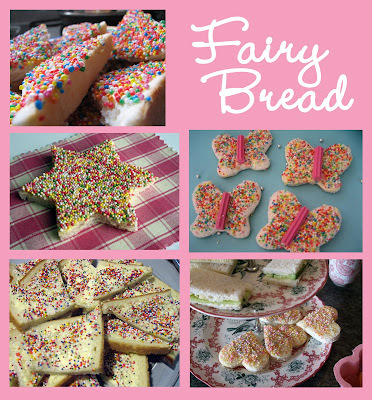 No matter what you may have heard, Fairy Bread is not only for kids' parties. Big Kids love Fairy Bread too! At my recent Mad Hatter Tea Party themed 30th - the Fairy Bread was fast to go! My first tip is to go to your local bakery and ask them to slice your bread long ways, so you get big long pieces. This will mean less waste if you use cookie cutters to cut shapes out of the bread. Oh, and that was my second tip. Use cookie Cutters to cut shapes out of the bread! TO go that little step further - you can use a shape to suit the theme of your party. Thirdly, butter the bread well ensuring good coverage, then place butter-side down into a plate/bowl full of hundreds and thousands, lightly press, and gently shake off excess sprinkles. In my years of experience of Fairy bread - it gives the better coverage of sprinkles to bread than sprinkling over the buttered bread~ and the hundreds and thousand stick better too! Fancy Fairy Bread..... again so many options. If you are having a big party, perhaps you could ask your baker to make you a few special loves of "coloured bread" pink is popular, but maybe green of blue can "boyify" your Fairy Bread! The addition of musk sticks in the picture above make the butterflies special. The use of colored Icing can make it special. 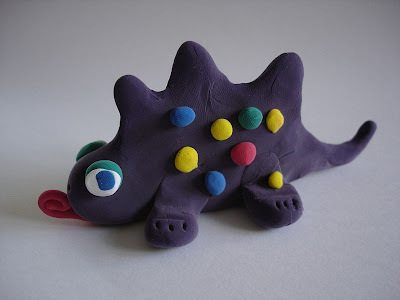 Use this idea on a plain milk arrowroot biscuit and sprinkle with hundreds and thousands for a "fairy bread" that won't dry out too quick outside. Use tiered cake stands to display or separate the different types you make, even stick a layer of sandwiches in between! 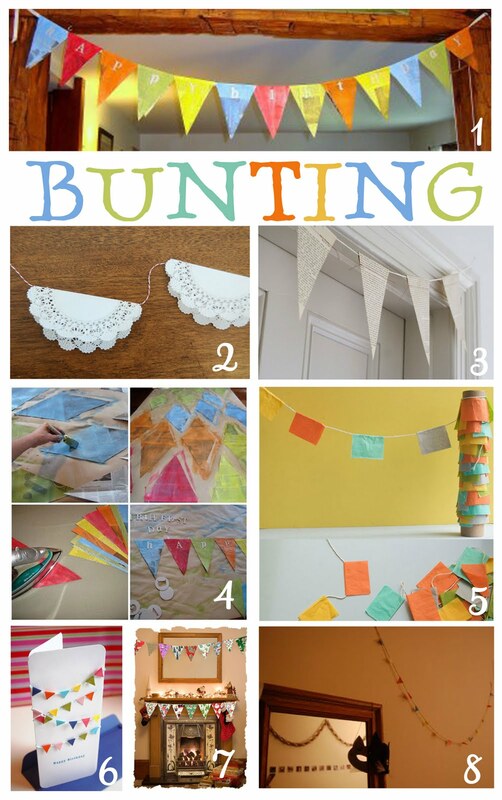 There are almost as many ways to make bunting as there are ways to use it. The collage above includes some favourites. Also check out the bunting in the picture at my sister's wedding in my blog about signs a few days ago. First choice you have to make is what kind of materials you are going to use, which depend on where you wish to use it. Newspaper bunting will not hold up to a shower of rain, and small triangles could get lost in the brightness of the sun. 1. Shows a Newspaper Bunting, and has letters painted/stuck on to convey the message. 2. An alternative to bright coloured bunting, is to use paper doilies. 3. Newspaper Bunting again, without colour. You could even use some sheet music to personalise it. 4. making the Newspaper Bunting as seen on mayamade blog. 5. Make one with Small squares in your chosen colour scheme. These look great draped around the skirt of a table, across a window or to dress a mantle. 6. A cute gift card with bunting across it - would also make a great invitation. 7. Using Christmas themed papers or material would make a great themed decoration. This can be adapted to all kinds of occassions and events. 8. Similar to the mini bunting in pic 5, this involves folding the squares on the diagonal to create a triangular pattern. Not only great for School Holiday Boredom Busters, but a fun theme for a Kid's Party or even a great cheap Party Favor! Divide the mixture into the number of colouring you have. Add food colouring to each piece of the uncoloured dough. Turn out onto the bench and knead well. Store in airtight containers to prolong it'd life. Send it home with the kids as a party favour - just make sure you label it so that they don’t try to eat it! Signage can be and important part of your event. Even if it is a parking sign out the front of your house. People don't like to be told what to do, but a simple sign can be a subtle way to make sure your guests do what YOU want. The photos above were a couple of signs from my sister's wedding. The top picture is one of my favourite photos from their wedding. Garry (her now husband) made the left sign from old wooden pallets, and some spare paint from the shed. It was a great way to lead guests to the wedding ceremony site down the hill. Mandy even made windmills to line the way! The sign on the right, I made, inspired by the opening sequence of a wedding video I found online. I fell in LOVE with this video, and HIGHLY recommend checking out Jessica Claire & Jeff Norwood's Wine Country Wedding!! The sign is shown above it is sitting in an old cookbook holder. We painted a crackle finish on it, and used cut vinyl for the text. A coat of sealing varnish and it would look great at the entry of their marital home. Although this is a great DIY project, the look was so successful and had so many comments, that I am now making these custom signs in my shop. 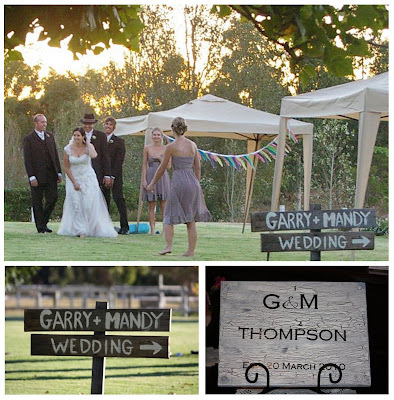 We can customise the colours and even the fonts to match your wedding decor.